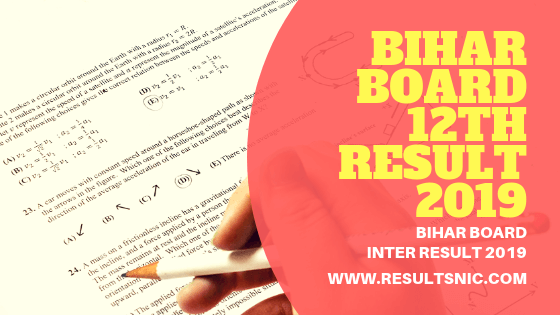 Bihar Board 12th class intermediate Results 2019 have been declared by BSEB and the pass percentage for this year is 79.76 percent. Students can check their results on the official website of Bihar board now. This year, 13.15 lakh students were registered for the examination that was conducted between February 6 and 16. BSEB has decided to declare the results on March this year. Last year the result was declared on June 6. Intermediate exam results were announced by Bihar Education Minister. The students who have appeared for this year’s examination can now access their result at the official website - biharboardonline.bihar.gov.in. The pass percentage is 79.76 percent which is an improvement of 26.81 percent point as compared to last year’s 52.95 percent. Bihar Education Minister Krishna Nandan Prasad Verma, along with BSEB Chairman Anand Kishore and top officials of the Education Department, announced the results at a press conference. Click on the link for the 12th class Intermediate exam result. Enter the necessary details (Code Number) and click on submit. Your Bihar board 12th marks will be displayed. Take print out of the result for future reference. More than 13 lakh students had appeared for the class XII board exam this year at 1,339 examination centres. The exams were conducted from February 6th to February 16th, 2019 for all the three streams, that is Arts, Commerce, and Science. As it happens with every major exam results when large number of candidates try to access to the result website at the same time, the Bihar Board result website is not responding right now. Students are advised to have patience.